Amid her move away from Abstract Expressionism to figurative art, the painter Rosemarie Beck reminded herself – and any young painters she might one day address – to aim for, “Not a style, but style.” That call to keep technique supple, to remain able to react to the needs of each individual picture, often comes to mind when I look at the artist Rebecca George’s work. 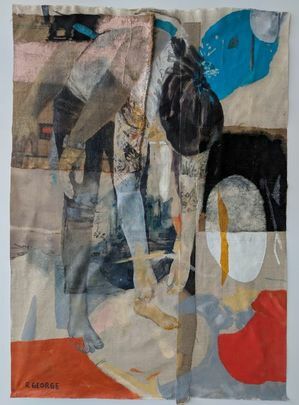 That’s not to say that George lacks a coherent aesthetic, or that a viewer would struggle to find connections between her figurative and nonrepresentational work. It is to say that she remains alive to possibility as an artist; the given day may bring out something unexpected even to her, and to ignore or try to work around that surprise would be a kind of malpractice. George has spoken to this approach, noting in a statement on her process as an artist that, “As my work shifted from a focus on smaller, precious pieces about animals to more figurative and large scale, I became interested in documenting the stages of the painting as a way to develop insight into my decision making as I moved through each piece. I do not see this series as works in isolation, but rather as a collection of works that directly reflect my state of being, which is fluid and progressive.” Her move from smaller pieces to larger ones seems an inverse journey to the one the artist Max Neumann experienced following slipped discs in his back. He was forced to give up on the large-scale works he’d favored and take on smaller pieces. The difference, per Neumann? When working on larger pictures, “the images arose from the body’s movements.” George seems to do him one better in this respect. Her small-scale nonrepresentational pieces often have a gestural quality that replicates bodily motion, and those strokes, their grace, languor, or intensity, find echoes in her larger works. Or she could nod to Kline and suggest they discuss the associations and implications between the brooding cloud of black at the center of her painting and its title. He did, after all, name Chief after a train he admired as a boy, and for my money, Interlocutor makes a profound statement visually, while its title provides just the right amount of context to get me started wondering about its origins. Although I’m currently rereading seven books, there’s two I’d like to mention in response to your interview questions. The first: The Long Quiet Highway by Natalie Goldberg. The second: The Peninsula by Louise Dickinson Rich, an autobiographical account of living on a coast in Maine. I’ve read everything both writers have published but am currently engaged with these two in particular. I’m rereading The Peninsula because I truly enjoy how Louise describes everyday life, taking into equal account the natural environment, all social aspects, her living quarters, and how she feels in response to it all. Her vision and insights are so clear and plain that the feeling I have is she would express the same sentiments to anyone who would care to listen. Her generosity of mind and heart creates a feeling of companionship for me, as though she’s bringing me along but nothing is expected of me–she is not attempting to alter my view or beliefs or challenge me to understand anything. That may sound tame and uninteresting, but in my experience, her writing in each case, gives me the space to view her subject(s) from any distance and that includes providing me with the space for reflection. She puts in the details that allow me to truly see her, and as an artist, I am particularly respectful of that level of transparency. The Long Quiet Highway by Natalie Goldberg is my favorite of all her books, although each of them have given me a greater appreciation for Natalie as a person, an artist and a teacher. Natalie’s books are also autobiographical. Additionally, they each have an element of instruction, as a writer addressing a writer. Sometimes I can substitute painting in the context of her advice, but not always. Natalie is very focused on learning one’s own mind and in painting, as a teacher and painter, my understanding of creativity is mindlessness. Non-thinking. Making decisions, being highly conscious, but not in a thinking place. Perhaps the artform of writing must include thinking in order to form it’s material (words). I reread this book because it gives me a calmer understanding of the relationship between my past (childhood), the choices I made as a young adult and that trajectory into my present day commitments. By modeling that growth through sharing her own personal accounts, Natalie opens her life to the reader as an example of seeking to actualize a deeper understanding of oneself: creatively, spiritually and in relationship with others. I behold my own experiences with more purpose and understanding in the light of Natalie’s self-reflections. George has a show set for December at The Art House (Art Party, December 9-31). You can get a look at what will be on display, as well as installation views, via Artsy (set aside time – it’s worth lingering with this work, and you’ll likely click through to a handful of additional artists and then realize hours have passed and you’re starving). And if you’re in Chicago, by all means put it on your calendar as a great way to wind down the year. Great article! Thank you for sharing your insights and observations. My pleasure, and I hope you have a great turnout for Art Party.